The Partiologist: Valentine Bags & Tags! 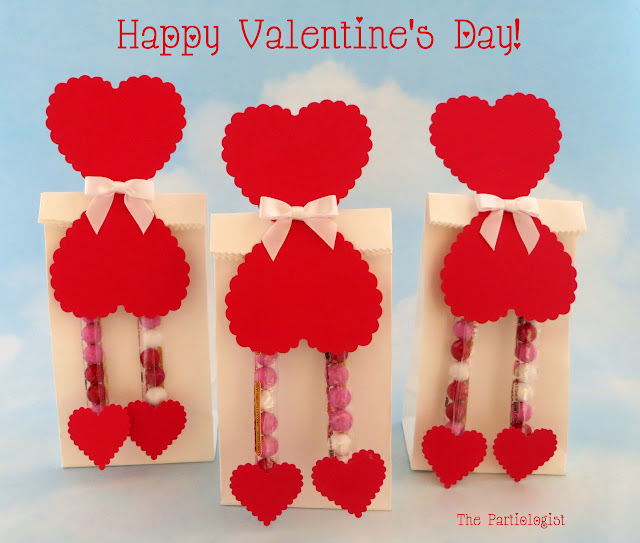 I'll keep this short, I've got a few cute ways to celebrate Valentine Day! Blow Me A Kiss Valentine! I knew then and there I had to recreate it! I have to say, it's a brilliant idea don't you think? And I made a printable for you, yes I did! Something "dressy" for Valentine's Day! In a bag complete with Valentine Party Dress! The little legs (Sixlets) are from the Dollar Store. White paper bags from Hobby Lobby. What little boy wouldn't love a bag of gumballs? I created these just for him! Use a square scalloped punch or Avery white business cards. 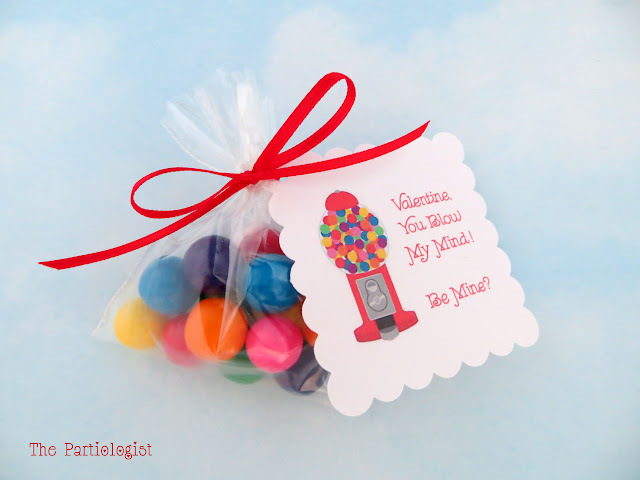 Having leftover Kisses, I came up with another Bag & Tag! And printables because I love you! I hope you Chews me for all your Valentine needs! Love the "Blow Me a Kiss." Your little kiss printable on the bottom of the Hershey's is an adorable touch as well . . . but then, I wouldn't expect anything less than adorable from you! You are right, the "Blow Me a Kiss" gift is absolutely BRILLIANT! I like all of the ideas, you are amazing! Where I can buy or order the clear pillow box? Thanks! Thanks! I added a link to purchase the clear pillow box! Such darling tags and labels! These are all such fun and adorable ideas. Thanks Paula, as always I appreciate your comments! Such sweet ideas!!! Love them all!! Hi Tricia! Thanks for stopping by - I've been sick and haven't had a chance to catch up with everyone's posts! Where did you find the tubes that hold the bubble gum and hershey kiss? So cute! Thank you Renee! 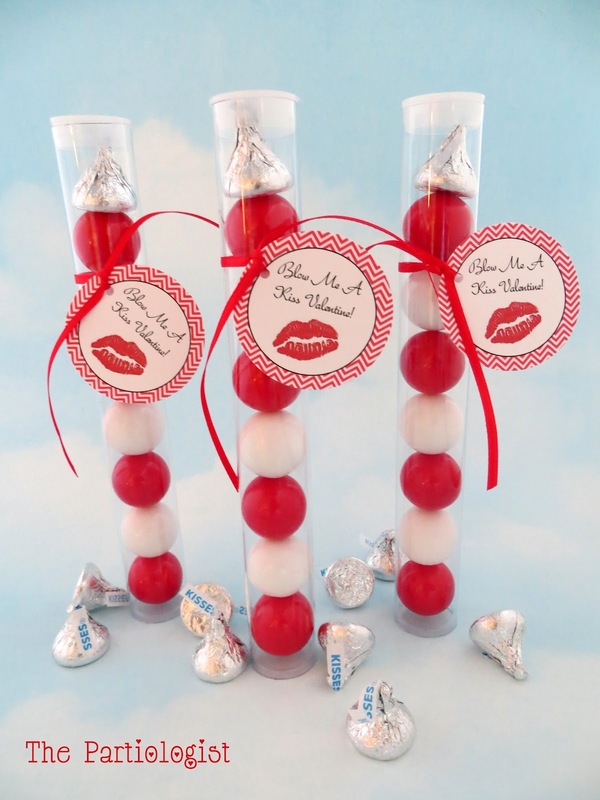 I think if you search candy tubes on etsy, there are several places to order. I don't remember who I got mine from.